SEATTLE (CNS) — Retired Seattle Archbishop Alex J. Brunett remained in critical but stable condition in an intensive care unit at Overlake Hospital in Bellevue Sept. 16, four days after suffering a stroke and undergoing surgery. Archdiocesan spokesman Greg Magnoni said Sept. 16 that following his stroke, surgeons successfully operated on the archbishop to remove a blood clot and stop some bleeding on the brain. Following surgery, he was able to respond to voice commands, Magnoni said. 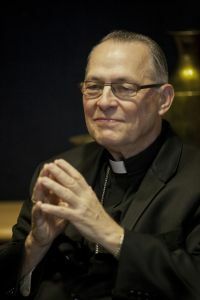 Seattle Archbishop J. Peter Sartain, who succeeded Archbishop Brunett as the spiritual leader of nearly 1 million Catholics in western Washington, was on hand prior to the surgery and administered the anointing of the sick. Magnoni said the archbishop was expected to remain in intensive care for several days and was not yet able to receive visitors, but the prognosis for a full recovery was good. Archbishop Brunett headed the Seattle Archdiocese from 1997 until he retired in 2010 at age 76. Archbishop Sartain was installed in December 2010. A Detroit native, Archbishop Brunett studied at Sacred Heart Seminary in Detroit, the Pontifical Gregorian University in Rome, the University of Detroit and Marquette University in Milwaukee. He was ordained a priest for the Detroit Archdiocese in 1958. When he was appointed the archbishop of Seattle, he had headed the Diocese of Helena, Mont., since 1994. He has worked in ecumenical relations and was co-founder and first president of the Ecumenical Institute for Jewish-Christian Studies in Detroit and is a past president of the National Association of Diocesan Ecumenical Officers. Archbishop Brunett is a former co-chairman of the West Coast Dialogue of Catholics and Muslims, sponsored on the Catholic side by the U.S. bishops’ Committee on Ecumenical and Interreligious Affairs. He also is a former co-chair of the Anglican-Roman Catholic International Commission. He is a member of the bishops’ Subcommittee on Native American Catholics. In September 2012, Pope Benedict XVI named the retired prelate to be apostolic administrator of the Diocese of Oakland, Calif. He served in that role from October 2012 until May of this year, when Bishop Michael C. Barber was ordained and installed to head the diocese, succeeding Archbishop Salvatore J. Cordileone, now head of the San Francisco Archdiocese.